As Flint Michigan residents paid some of the highest prices in the country for their toxic water, the multi-billion dollar Nestle Corporation continued to pump millions of gallons of water out of Lake Michigan for free! In fact, Nestle gets some major tax breaks for taking clean water from the Great Lakes while residents of Flint pay more than $864 a year per household for water that is making them sick – all while their state and local officials deny responsibility. 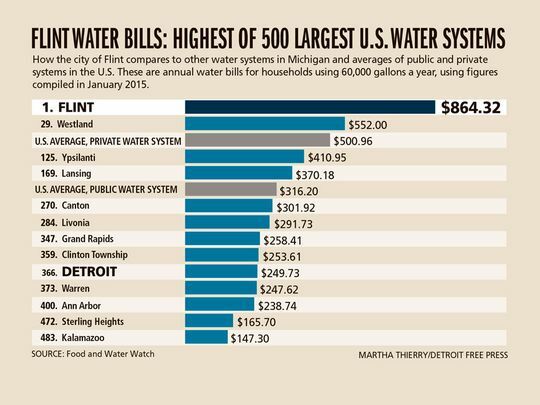 This is double what most Americans pay for clean water, only Flint’s water is far from clean. How is it that a company known for saying “water isn’t a human right” gets access to water freely, while city residents are paying through the nose for water that is riddled with lead and other contaminates? Some residents had their water tested, and it was found to be 27 times over the Environmental Protection Agency’s limit for lead! How do Nestle and the city municipalities within Michigan get away with this? Is this all part of Nestle’s water privatization scheme? Large companies like Nestle have a track record of creating water shortages. Does their access to water from the Great Lakes impact Flint Michigan and other areas that had to rely on the Flint River instead of Detroit’s decaying water system? “So not only do low income Flint residents technically pay more for Michigan water than Nestle, but now they’re also forced to buy bottled water from Nestle to stay alive. Flint residents are in the deplorable position of being forced to buy Michigan water from two different parties. With a lawsuit and activist pressure, Nestle has been forced to reduce withdrawals from 400 to 200 gallons a minute, but they continue to receive this water for free, while Flint residents scramble for clean water to drink, shower in, and use for sanitary cooking. While Nestle pockets millions for bottled drinking water from a nearby source, Flint is poisoned to death while it goes bankrupt trying to pay for water that isn’t potable.